They wanted to topple Mubarik and his regime. That was the first phase. They wanted to end the old regime for ever. except torment Copt and women and Shia. They smiled and took Brother Morsi away. As the millions chanted ‘freedom’. Who will take the Army away? 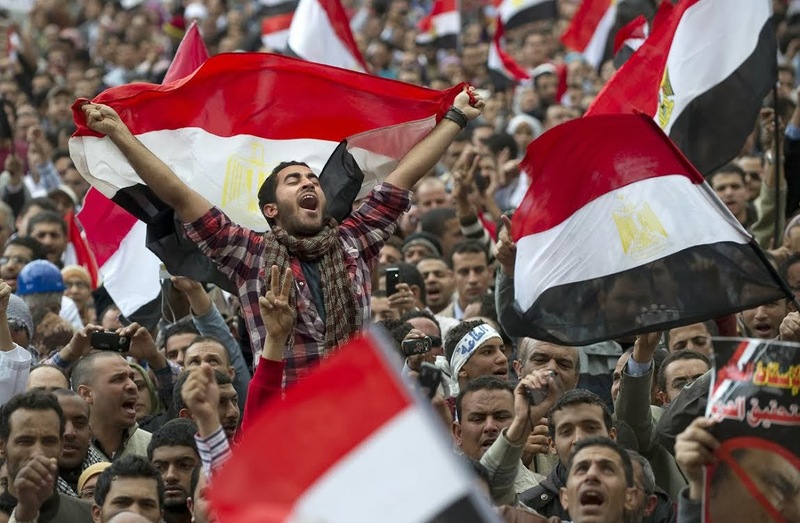 On July 3, 2013, Egypt completed a full circle: popular pressure had brought the military back in power, where just a year ago, people were celebrating the 'triumph of democracy’. The July 3 coup ended the rule of the first ‘elected’ president of Egypt. Mohhamad Morsi was indeed the first elected president because unlike his predecessors he contested a multi-candidate election (a first for Egypt since 1952 coup). But this was not the only novelty about the regime which lasted for only a year, and which was a result of massive popular uprisings popularly dubbed the 'Egyptian version' of the Arab Spring which started in 2011. Morsi was also the first president from an Islamists political outfit Ikhwan or Muslim Brotherhood (MB) in the entire Arab world. He was also the first President from a non-military background in Egypt. Hence, Morsi’s government triggered hope not only among his supporters and the cadres of the MB, and all those who directly participated in the elections that brought him to power, but also among his opponents and anyone who had any interest in Egypt. The July 3 coup by Egyptian military crashed all these hopes. This article is an attempt to look at the premise that the coup is just a temporary brake in the long drawn Egyptian revolution. Though almost all the countries in the West Asia and North Africa region faced the heat of the 'Arab Spring', it was Egypt that was, and remains to be, the centre of all the attention. The reason for this was the sheer size, history and geopolitical importance of the country. Apart from this Egypt has been politically the most versatile and active country in the region. Its vibrant political arena has survived all attempts by its military dictatorships to curb and demoralise pluralist articulations. The presence of so many groups (both legal and illegal) representing varied ideologies in the Egyptian political sphere has been its most priced possession, and that which helped revive the hopes of pluralist procedural opinion formation in the country. This was among the reasons why Egypt (along with Tunisia to some extent) saw a relatively peaceful popular mobilisation. Having said that, we can still argue that diversity in opinions and ideologies do not necessarily guarantee a successful revolution. In fact, it can be more of a problem if all the ideologies and groups claim, by and large, equal political support. This can result in the kind of ‘confusion’ we have been witnessing in Egypt in the past three years. In past centuries, the proletariat revolutions that we saw were successfully organised because they overcame such 'confusions' early on. There was one set of ideas and leaders which guided them out of these 'confusions' and helped them consolidate. Using the benefits of hindsight, we can say that a unique and much-cherished aspect of the Arab Spring -- or any other mass uprisings post-2008 for that matter -- was that it was without an unique leadership or a uniting ideology; in fact, its roots were entrenched in what we in social sciences call post-modernism. But, in fact, today if the Arab Spring is standing on the verge of losing all hope it is only because of this lack of a unifying leadership and ideology. Some would argue that the enthusiasm for ‘democracy’ among the masses could have been a unifying ideology. That the Egyptians want democracy is beyond doubt. But today, it appears there is a confusion regarding what kind of democracy they prefer, as the word itself carries so many meanings. Most commentators on political development across the globe are worried about the repercussions of liberal democracy in a polity where the strongest organised political movement dreams about establishing a theocratic state. The MB’s performance in the first elections after the overthrow of Mubarak is a case in point. Can we say that Morsi was not ‘democratically elected’? If we cannot say so isn’t it our responsibility, given our preference for ‘democracy’, to come out and defend the popularly elected president? Which group of Egyptian demonstrators is enthusiastic about what kind of democracy? Until these questions are answered, the task of consolidation of the gains of this revolution is not possible. Back in 1952, the then coup against the king of Egypt was considered to be a popular act. The army led by Mohammad Nagib established a typical ‘Arab Republic’, the legitimacy of which is more based on performance than any of the Weberian conceptions of authority. The concept of ‘Arab Republics’ -- a republic more because of its class orientations than the electoral paraphernalia -- became a trend, which spread soon throughout the Arab world engulfing countries such as Iraq and Syria, along with Libya. The ‘Arab Spring’ has paved the way for the redefinition of that understanding of republicanism. I think it was long overdue. Political revolution is understood in many ways. We can identify three broad categories for our convenience: Aristotelian, Marxian and Liberal. In all these conceptions however, change is not denied and debate is primarily about the nature and extent of the change and the role of human agency. Aristotle, for example, argues that any kind of change brought by whatever elements in the functioning of the state can be considered to be a revolution. It was more of a mechanical/literal understanding of the word revolution. Among liberals, Tocqueville and Huntington, along with Chalmers Johnson, have given their own understanding of the word. It seems there is a common understanding among liberals to view revolutions as something undesirable, and therefore to argue that it is high level of political unrest which can bring comprehensive change suddenly if the present dispensation does not take the aspirations of the new sections into consideration. In this argument revolution is not inevitable but a result of the failure of the system to change with time and needs. Marxism – and I am taking the risk of homogenising a very diverse literature -- argues that revolution is the tool of fundamental change necessitated by historical conditions and it paves the way for the creation of a new society. In other words, progress is related to revolution and so on. For Marx, and other Marxist thinkers, revolution is not always a synonym of socialist revolution. Hence, a revolution can be a bourgeoisie revolution or even a feudal one. But why talk about these various understandings of revolutions? The answer is obvious. Most of the commentators on the happenings in Egypt in particular, and the Arab world in general, have been fascinated by the term as much as they are confused by it. Their confusion has also affected most of those who are reading and following these events. It is always necessary to have a basic understanding of the concepts we are using in order to avoid these confusions, which are largely created and somewhat celebrated by postmodernist commentators. What is happening in Egypt, since the first day is revolutionary. But this revolution is primarily a liberal revolution as Aijaz Ahmed has argued in 2011. He termed it a bourgeoisie revolution very much on the line of French revolution. Whether it will remain so by the time it concludes is yet to be seen. Even the French revolution culminated, after almost two decades, in a dictatorship. So what is the hurry in drawing conclusions about the Egyptian revolution? It has just been two years and we are already singing about its demise. The fact is that most Egyptians have -- and this has been established beyond doubt -- rejected their old political system and have set an agenda for change. This agenda is comprehensive enough that when their first elected president tried to imitate his predecessor by enacting laws that would give him unrestricted power, they came out on the street in unprecedented numbers. So if there is a temporary partial going-back can we really conclude that it is the end of the entire process as some commentators have been quick to do? I do not think so. The rule of the military will not be accepted by Egyptians as they have already started mobilising against it. April 6, Kefaya or even the Tamorod (which was very instrumental in mobilising the military against MB government) have started pitching for a new phase of popular movement. If we find less popular enthusiasm on the Egyptian streets today it is because of the violence unleashed by the military against the MB supporters. It is also because any movement needs a break for its survival. Take for example, the Indian freedom struggle, which in its most popular form was a movement spread over at least three decades starting from 1919-20 and going on till 1942-43. I am not suggesting that the Egyptian revolution will also take that much time; but it is also unfair and incorrect to give so little a time to a movement with such great consequences, not just for Egypt but for the entire world. Hence, it is indeed premature to talk about the fate of the Egyptian revolution here. Nevertheless, we can still discuss some of its prospectus. Will the Egyptian revolution end in establishing some kind of democracy or will it degenerate into some kind of dictatorship, as we saw in the case of the French revolution? No one can concretely predict. However, given the levels of consciousness shown by the common people and their strong rejection of any kind of dictatorial act, it is very unlikely that General Abdul Fatah Al-Sisi will turn into another Napoleon. In the nineteenth century, the idea of liberal democracy was in its formative stage and therefore the spirit of French Revolution could not be called to have failed. Napoleon’s rule, no matter how ‘undemocratic’ was not to be compared with the reign of Louis XVI. We can fail to see the progress at our own peril. I mean who can deny that today democracy (at least procedural one) is not undesired even in the most politically unequal societies. All its faults notwithstanding liberal democracy is a move towards modernity. It’s a promise that a conception of liberty will be substantiated by the conception of equality. In this context Egyptians have achieved the overthrow of ancient regime, and now they are fighting for long overdue modernisation of their political discourse. However, the common apprehension about the real beneficiaries of the Egyptian revolution is not entirely misplaced. We should answer this question with caution. The beneficiaries for the revolution in its intermediary and longer phases will be not the same group of people. It is very clear, as was visible in the last elections that those who are organised and resourceful enough will be taking the lead. The MB was the first of those groups. They will remain there in one form or other, but groups like the new rich classes will obviously take lead in the intermediary phase as they have the resources and support of influential sections around the world. It is now up to the classes, placed on the lower rung, to remain politically aware and active to protect their interests in the long run. The revolution in Egypt will not bring any Jacobins to power because right now there are none. Those who are claiming to represent the interests of the working and poor sections of the population are themselves not organised, they are leaderless and visionless. In this situation, things will be similar to what happened in India after independence. The new ruling classes will make a few cosmetic changes, but will not be in a position or hold the intent to change the fundamentals of liberal structures. The chances are that neo-liberal policies will dominate. The hegemony of neo-liberalism is well-entrenched globally, and therefore Egyptians can hardly be blamed entirely if they see no hope in what was considered to be socialism. Even their own experience with socialism (the so called Arab socialism propounded by the Ba’th Party and Nassersim in the last century) is not that encouraging. Much like Nehruvian socialism in India, ruling classes in the Arab republics too flirted with the idea of egalitarian society, but without any love for it. The result was a situation of massive deprivation and poor economic base. In this context, it would be very difficult for the Egyptians to not to fall prey to neo-liberal experiments. Thus, while the Egyptian revolution holds massive potential, it is now up to the Egyptian people and their leaders to decide what course they will chart.